Back off, man. I’m a plumber. 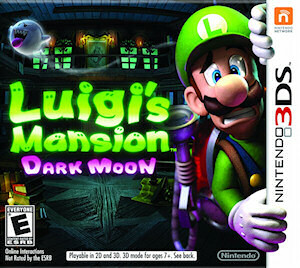 If you liked the original Luigi’s Mansion back on gamecube then you will love Dark Moon. If you didn’t enjoy it then you must be dead inside and I feel bad for you. Anyway, It’s the same basic idea: explore spooky mansion, collect money and stuff, capture pesky ghosts, etc. However this time around you get not one, not two, but FIVE different mansions to explore. Well, not all of them are mansions, but you get the idea. 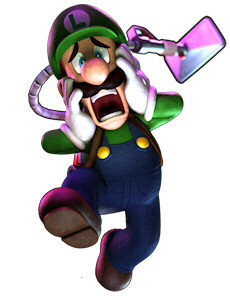 Along with his trusty Poltergust vacuum Luigi has a nifty flashlight with a stunning strobe-bulb and a darklight that can discover invisible objects that have been concealed by pesky boos. Catching ghosts is familiar, but stays fun with different kinds of encounters and ghosts who use different strategies. The game is quite charming and a real visual treat, especially with the 3D effects which really seem to add to the experience. The game is obviously never outright frightening, but it seems to conjure a whimsically spooky feeling like you’d get from classic Disney Halloween special or something. Maybe that sounds a bit convoluted but it makes sense to me. The music is also fantastic, but Keen and I have been humming that theme for years so maybe it’s just us. I only really have two complaints. The first being the game’s mission style format. Each mansion has 5 or so missions within it. You still get somewhat of a freestyle exploration but I really wish it was all in a single experience. The other thing is the gyro controls. To aim your vacuum up and down you need to tilt the 3DS in the corresponding direction. This is frustrating as it can distort the 3D image and the hinge on many systems are already loose. This isn’t technically required as you can press x to look up and b to look down, but they go to either extreme. If you want any angle in between then you need to use the gyro. Minor issues aside it’s a fantastic game and another great reason to own a 3DS. There is a lot of content to explore, plus collectibles and level ranks. Oh, and did I mention online ghost busting multiplayer? Bomb dropped. Next PostI’m a stone cold G, playa. Is it just me or does the 3DS have the best library of games at this point? The 3DS definitely has a great library. My only complaint is that they seem to trickle in.